For Halloween, my class read a story called The Little Old Lady Who Was Not Afraid of Anything. 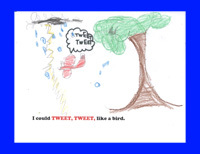 This story contains examples of onomatopoeia (words that stand for the sounds things make). After reading a book from our library called If You Were Onomatopoeia, the students in my class came up with thier own sentences copying the story pattern. It came out so cute that I asked Mrs. Bang, our librarian, to help make it into a photostory to share with our families. Just click on the picture below to view the photostory... I hope you enjoy it. If you have Windows Media Player on your computer, just click on the picture above to view the photostory.